Kay set up Blackstone Physiotherapy in 1999 from which time it has continued to expand and is one of the most rapidly developing Private Physiotherapy Clinics in Northern Ireland. 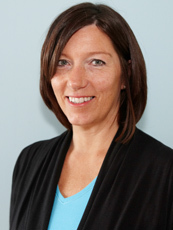 Kay qualified from the University of Ulster in 1985 and has gained experience in many areas of Physiotherapy. She previously worked as Clinical Tutor in Musgrave Park Hospital, Belfast and is a recognised teacher at the University of Ulster. Kay has training in Acupuncture, Body Control Pilates, Orthopaedic Medicine, Manipulation, Biomechanics, Adult and Paediatric Neurology. Kay is the Regional Representative for the Acupuncture Association of Chartered Physiotherapists. She has become an MBT retailer and has been awarded Accredited Retailer Award ensuring excellence in fitting and advising in the use of this Physiological Footwear. As well as treating patients,she manages the Practice ensuring all areas maintain excellence. Kay started Pilates Classes in 2003 and there are now 11 classes running each week. She has a keen interest in educating patients to have better posture in order to minimise pain and dysfunction. She has attended the European Hockey Championships as Physiotherapist for the Irish boys in 2002 and several other tournaments following this. Kay has recently been developing Corporate Physiotherapy for businesses in an attempt to reduce sickness absence due to musculoskeletal disorders.